For the first time, the southern African nation is seeing the military oppose Robert Mugabe, 93, the world's oldest head of state and one of the longest-serving authoritarian rulers. HARARE, Zimbabwe — Zimbabwe’s military was in control of the capital and the state broadcaster on Wednesday and was holding President Robert Mugabe and his wife under house arrest in what appeared to be a coup against the 93-year-old Mugabe, the world’s oldest head of state. The military was at pains, however, to emphasize it had not staged a military takeover, but was instead starting a process to restore Zimbabwe’s democracy. Still, the military appeared to have brought an end to Mugabe’s long, 37-year reign in what the army’s supporters praised as a “bloodless correction.” South Africa and other neighboring countries were sending in leaders to negotiate with Mugabe and the generals to encourage the transition. 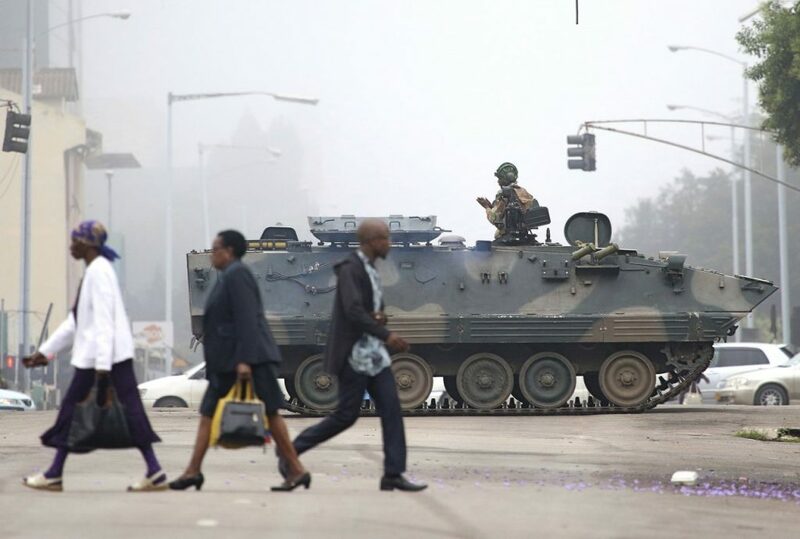 Citizens in Zimbabwe’s tidy capital, Harare, contributed to the feeling of a smooth transition by carrying on with their daily lives, walking past the army’s armored personnel carriers to go to work and to shops. Many who have never known any leader but Mugabe waited in long lines at banks to draw limited amounts of cash, a result of this once-prosperous country’s plummeting economy. Felix Tsanganyiso, who sells mobile airtime vouchers in Harare, said he was following the developments on WhatsApp. The series of whiplash events followed Mugabe’s firing last week of his deputy, which appeared to position the first lady, Grace Mugabe, to replace Emmerson Mnangagwa as one of the country’s two vice presidents at a party conference next month. Grace Mugabe has been known as the leader of the G40, a group of Cabinet ministers and officials in their 40s and 50s who are too young to have fought in Zimbabwe’s war to end white-minority rule in Rhodesia. When Mnangagwa was fired, the generals and war veterans felt they were being sidelined and took action to stop that, analysts say. Mnangagwa’s whereabouts were not clear Wednesday. He fled the country last week, citing threats to himself and his family. Critics of the government urged Mugabe to go quietly. “The old man should be allowed to rest,” former Zimbabwe finance minister and activist Tendai Biti told South African broadcaster eNCA. On Monday, the army commander made an unprecedented statement criticizing Mugabe for pushing aside veterans of the liberation war. The following day, the ruling party condemned the army leader for “treasonable conduct” and that evening the army sent armored personnel carriers into Harare and seized control of the state broadcaster and other strategic points, including Mugabe’s residence. In a televised address to the nation early Wednesday, Maj. Gen. Sibusiso Moyo said the army had “guaranteed” the safety of Mugabe and his wife, but added the military would target “criminals” around Mugabe, in an apparent reference to the first lady’s G40 group. In Washington, the U.S. State Department said the Trump administration was “concerned by recent actions undertaken by Zimbabwe’s military forces” and called on the country’s leaders to exercise restraint. The United States “does not take sides in matters of internal Zimbabwean politics and does not condone military intervention in political processes,” it said in a statement. Who will rule Zimbabwe should become clearer in the coming days. “There is a soft transition underway,” said Zimbabwean analyst Alex Rusero. Mnangagwa may well be installed as a transitional leader to return Zimbabwe to constitutional rule, Rusero said. Zimbabwe may enter a period of negotiation to get Mugabe to step down voluntarily, said Piers Pigou, southern Africa consultant for the International Crisis Group, who also suggested that Mnangagwa may be an interim leader.